Since it is powered by Google, it is also functional on most mobile devices (although a bit unwieldy over slow data connections). Hopefully I will have the border graphics, a few other tweaks, and a couple of new features ironed out soon (all depending on RL not interfering as it is want to do). Thanks SSG and Cordovan. I really appreciate the opportunity to resurrect this. Last edited by Garan; Jun 04 2018 at 09:04 AM. Not to my browser, evidently. It's IE, and yes, I know it's antiquated. My husband the programmer says "You can switch to Firefox; you can transfer all your bookmarks." What he really means is "*I* can transfer all your bookmarks, and one of these days I'll get around to it." Hope on, hope ever; maybe by the time he gets me transferred to Firefox, your map will be done and I can look at it. Keep up the good work. IE versions 10 and 11 should work. I know IE 8 does not so XP users will need a different browser. The screenshots were taken with IE 11. Firefox over all is a better browser than Edge and Edge keeps trying to install a flash plugin that I do not want and my AV freaks out over the plugin. However, be aware, firefox, at least my copy does, takes a gig a ram and does not release it at exit. Well, I had to call my husband over to *find* what version of IE I have. (When I click on my home page, it says "Google.") He managed to work his magic on it and tell me it's version 11. However, when I tried to open one of your maps, hoping to get a larger image and get a better look, I got the same image, maybe 5% larger, and the message "You seem to be using an unsupported browser. Please update to get the most out of Flickr." Now, updating IE is a thing that can't be done any more. Obviously I need to move to another browser. But I Don't Know How. Ancient history: back in 1998 I was using Netscape, until I joined the Asheron's Call Advocate team, and had to switch to IE because that's what they were using. Twenty years later, I am aware that IE is on its way out; I'm still using it because of two forms of inertia: the problem of transferring a large number of bookmarks to Firefox, and the problem of getting my husband to do it for me. I am looking forward to when you get this ready for release. Ah. That is just flickr.com the site I used to host the screenshots. They're owned by yahoo so they complain that you need the latest browser but that has nothing to do with google. When you are viewing the image on flickr, there should be an icon in the lower right of the browser with two arrows pointing diagonally out - click that to get a full size version (the screenshots were only 1832x983 so they aren't terribly large anyway). If you have IE 11 and you are able to view any other google maps then you should be able to see this one without any nasty-grams or issues when it becomes available. nice. looking forward to that! Looks fantastic so far. Great work! Can't wait to see the final product. I'm still using it because of two forms of inertia: the problem of transferring a large number of bookmarks to Firefox, and the problem of getting my husband to do it for me. When you first install the current version of Firefox the first page (which opens automatically at the end of the install) asks for your email, which you can skip, then the next has at the top of it, "Try Firefox with the bookmarks, history and passwords from another browser." and an "Import Now" button that will import all your bookmarks for you from whatever browser you choose. I would be amazed if you have any issues with this process and need to involve your husband. You can download the latest Firefox version here. BTW, If anyone would like to suggest better icons for NPCs and treasure caches (two icons that SSG doesn't have in-game), I'm open to suggestions. The icon has to be a 30x30 image and should be easily recognized as 'an NPC' or 'Treasure Cache' - preferably in png format (the sprites are in a png image). Ideally it will have enough contrasting colors to be easily spotted against any map background (the only reason I made the simple white silhouette). You can either post your image here or send me a PM. Any submitted suggestion must be royalty free (please don't just copy something from another site) to be considered. The only compensation will be bragging rights to your friends and other associated geeks that you made the icon(s). The final choice will be made by the map development team (ie. me). Last edited by Garan; May 09 2018 at 04:40 PM. My experience viewing the screenshots on IE11 is rather different, although I do get the message about using an outdated browser. They are the same size as with other browsers but IE fails to render the images properly and they are blurred. I remember the map from before, so it is great to see that you have kept trying to bring it back. Thanks! Looking forward to it. Isn't street-view going into first person mode in-game? That's a good question. It's not guesswork, but rather based on the in-game coordinates of those locations. The game world is actually made up of four regions with their own coordinate systems (which complicated the Google map a bit but more on that in a minute). Each region is self consistent and Gondor and Mordor are also consistent with each other (the origin of the coordinate systems in Gondor and Mordor is the same) so there are really three distinct coordinate systems, Eriador, Rhovanion and Gondor/Mordor. 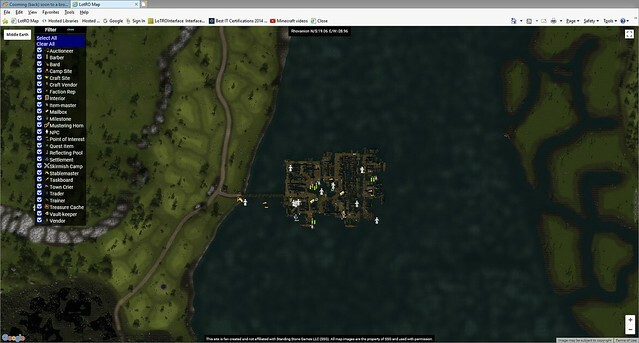 Since all of the map tiles are positioned based on the in-game coordinates, everything is consistent within a region - so as far as U22, the terrain was placed based on where the game engine indicates that the player is when traversing the terrain - this is necessary in order to properly place annotations based on in-game coordinates (given a Region and N/S, E/W coordinates, a simple formula can map the correct location on the Google map). 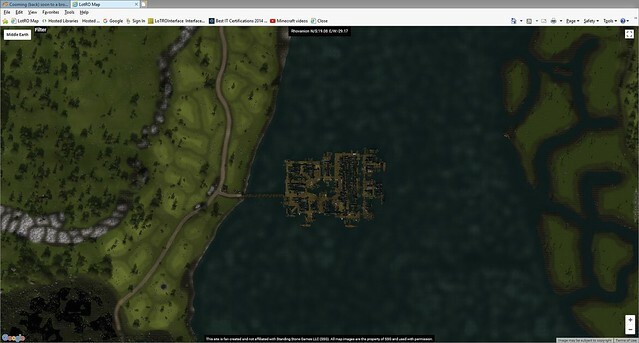 So all of the U22 terrain is positioned relative to the rest of the Rhovanion region. Now, that only leaves how Rhovanion is positioned relative to Eriador and Gondor/Mordor. There are three significant overlaps between the regions - the most obvious are Minas Tirith that exists on both the Gondor map and the Mordor map and Isengard which exists on both the Eriador map and the Rhovanion map. The last one is slightly less obvious but it is the falls at the Argonath which exists on the Rhovanion map and the Gondor map. Using those three landmarks we can position each region relative to the other regions and create one contiguous map (I chose to pick which version of tiles were displayed in the overlaps based on the rivers that provided natural dividers). So, the U22 terrain is positioned exactly where it is supposed to be according to the game world. There is one oddity, the old Erebor instances for The Lonely Mountain and Dale did indeed place those areas further North (you can see the inconsistency by starting any of those instances and checking your location and comparing that to the location shown when you are in those areas on the non-instanced U22 landscape). I chose to remove the old (now inconsistent) terrain from the TerrainMap plugin since it conflicted with the open world landscape and the Google map only shows the non-instanced version for the same reason. The Google map does have two inconsistancies, Moria and Zirak-Zigil. Moria is placed off to the side since it is supposed to exist under ground. Zirak-Zigil is placed roughly where it would be, above Moria, between Eriador and Rhovanion. Once it goes live, you will be able to see that I made sure to adjust the coordinates that are displayed when moving from an area with one coordinate system to another so that the correct coordinates for the region are displayed based on where the mouse is positioned. So, if you move the mouse over an area in Moria, you will see Rhovanion coordinates that match the locations in game. Hopefully that sheds some light on the process that goes into placing terrain so that it lines up with in-game coordinates. Last edited by Garan; May 11 2018 at 02:27 PM. Very nice work Garan, waiting for the public release! So looking at the placement of MOria on this map, does that mean by coordinates it actually exists where Minhiriath would be? That looks like it could be problematic if they ever want to go that direction. It's also fascinating to see that the Ettenmoors is actually connected, and how close to connecting Angmar and Forochel, and Angmar and the Lone Lands are. Moria is considered part of Rhovanion, not Eriador. Those two are separate maps. Moria is an oddity - a three dimensional space on a two dimensional map. It doesn't fit in a contiguous map of Middle Earth properly because game-wise it is in Rhovanion but it overlaps part of the already developed above ground terrain from Eriador (a big chunk of Eregion). 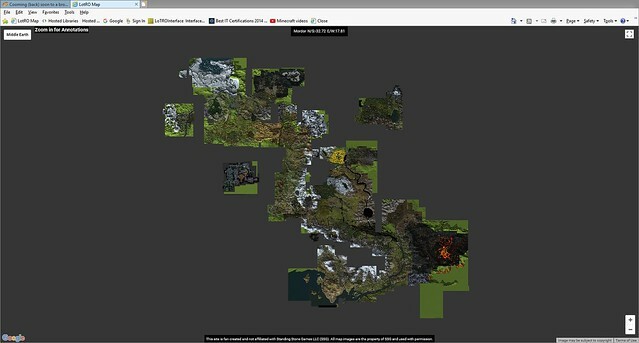 In the original Turbine version of the Google map they pushed Rhovanion to the right to make room for Moria, but they hadn't released helm's deep yet so they didn't have to deal with the fact that Isengard exists in both regions (different versions, one prior to flooding the other post flooding). When lining up Isengard, Rhovanion is positioned further west and there's no room for Moria without overlapping Eriador so I placed it in currently "empty" space. Since it is one of the two exceptions (the other being Zirak-Zigil) that have existing terrain where the in-game coordinates place it, their coordinates are adjusted prior to display (mousing over the map will actually show in-game Moria coordinates over the Moria inset). It can be moved in the future to make room if Turbine develops the terrain where it was placed. 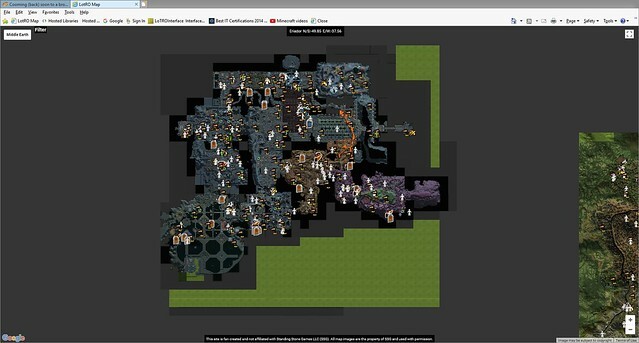 Once the border graphics are in place it will be more obvious that Moria is shown as an "inset" on the map. I may move it a bit further south west to make that even clearer, I haven't seen where the coast lines up with the map yet - I know the background images from the original Google map place the coast too far north to line up with the area developed around Dol Amroth so the border will need quite a bit of work. Last edited by Garan; May 11 2018 at 02:25 PM. As WBS says, Transferring IE bookmarks to FireFix is easy; I have done it dozens of times, across XP, XP64, Win7 32 and Win7 64, and never had an issue. The only real issue with FF is all the addons; there are so many good ones that some people get carried away and install far too many, then complain that FF runs slowly. Very cool! I can recall this somewhat. I think. Something.. Very cool! Oh I already said that. I have a faint thought about a cartographer group or something back then.